We all know where Han Solo ends up, but where did he come from? Some people want to know and others could care less. But Disney is giving us his story and it’s probably as good a film that could have come from such a concept. “Solo: A Star Wars Story” is a film no one asked for but it exists anyways and it works. The cast is well realized and it looks and feels like the other Star Wars films. It’s a fun, light adventure that will satisfy fans anxiously awaiting Episode IX. I always wonder what could have been with directors Christopher Miller and Phil Lord initially at the helm, but Disney didn’t see eye to eye and they were replaced by the extremely vanilla Ron Howard. Howard is a fine director though he hardly takes many risks and offers little in the way of visual wonder (though I’ve been particularly impressed with some of his recent offerings like “Rush”). Howard is the safe choice and “Solo” certainly is safe movie. There’s nothing really wrong with it, but it won’t win any new fans. You pretty much know what you’re getting and that’s not necessarily a bad thing. 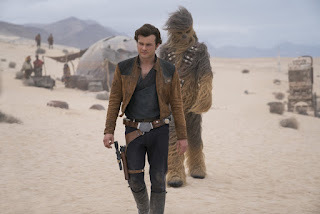 The film, taking place in the years between Episode III and Episode IV, the film follows a young Han Solo (Alden Ehrenreich) a smuggler who works in and around the criminal underworld. He’s a tad more optimistic than his older self (we know that because he says things like “I’ve got a GOOD feeling about this”). Emilia Clarke, making her way through nerdy properties (ie Game of Thrones, Terminator), appears as Han’s love interest Qi’ra. After an event that leads to her capture, Solo trains with the Imperial army and eventually leads a daring heist that involves a highly sought after fuel called Coaxium. Woody Harrelson shows up as Han’s mentor Tobias Beckett, and we meet familiar faces along the way including Chewbacca and Lando Calrissian (Donald Glover). Paul Bettany is fine as the film’s villainous crime lord Dryden Vos. Howard directs the film with an assured hand. The action scenes are well-shot and suspenseful. The actors are fantastic in their roles. The visual effects work and the cinematography from Bradford Young (“Arrival”) has an appropriately dark and grungy look. John Powell’s score, which uses lots of John Williams cues, is fantastic and uplifting. The film functions, much like “Rogue One,” as a fun heist film. It’s obvious the film was made for fans even if they never really wanted it.